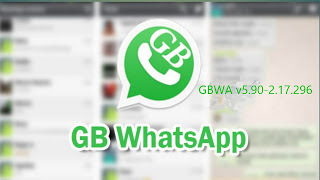 GBWhatsapp has released another version of it app called GBWA v5.90-2.17.296 with new features and goodies , we all know the most interesting thing about this Whatsapp is that you don't need to delete your official whatsapp in other to install this GBWhatsapp , as both can run fine on thesame device. GBWhatsapp is a very nice app thats a clone of the official Whatsapp and it comes with some features that'a not present in the official app.Check out some it's features below. ➽ You can see the active people on your group , and also see the inactive once. ➽ You can choose a background of your choice . ➽ You can send broadcast messages to over 600 people compared to that of the official which is 250. ➽ You can send all types of files and documents like Mp4,Mp3, Zip ,Apk, Pdf and even bigger videos sizes. ➽You can preview a picture without downloading it. ➽ You are able to set Security Password to your caht , to secure them. ➽ Various text and line colors included. ➽ You can remove the "Date stamp " or "Name" while copying a message. ➽Custom privacy for Hide /view status. ➽Addedoption to send original image. ➽Unlocked Album features when you send more than 3 images . ➽You can now upload text status. ➽Auto Backup chat at 2am. ➽You can now share apk through file manager and then select whatsapp. ➽Updated Spanish and Italian language . ➽Emoji icon color fixed .